History: (Alpha Flight I#121 (fb) - BTS) - The Chess Set and Brass Bishop's criminal activities led them to fight with Puck. (Alpha Flight I#121 - BTS) - Some time later, the Chess Set kidnapped Hedison, a scientist. Hedison had claimed that a week before he was given "the power" from Silver and Auric who were both believed to be dead. The Chess Set leader, Brass Bishop, wanted to sell the power still inside Hedison and the corpses of Silver and Auric to the best offer. The Chess Set stole the corpses of the two dead mutants, then the Brass Bishop organized an auction for selling "the power" and built a device to transfer the power contained within the three bodies into a fourth subject. (Alpha Flight I#121) - The auction was held in an abandoned airstrip in Canada. Many criminals were interested in the Brass Bishop's offer: A.I.M, Arcade, Beetle (Abner Jenkins), Blackout (Lilin), Caliber, Cobra, Constrictor, Controller, Dr. Octopus, Fenris (Strucker twins), Fixer, Grey Gargoyle, Hobgoblin, HYDRA, Jack O'Lantern (Skeleton Crew), Klaw, Living Laser, Mandrill, Mysterio (Quentin Beck), Plantman, Rhino, Ringmaster, the Secret Empire, Stilt-Man (Wilbur Day), Taskmaster, Trapster, Vector. The auction was interrupted by Guardian and Spider-Man. 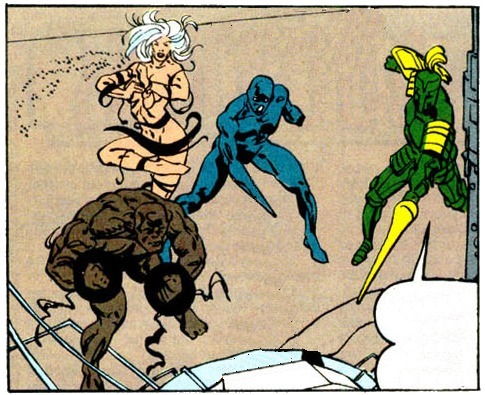 While the Chess Set henchmen at guard outside the hangar were neutralized by Puck and Wildheart, the Chess Set guarded the transfer device waiting for some of the other criminals to slay the heroes. But Nemesis arrived behind them and succeeded in shattering the Nexus device for the power transfer. The big, resulting explosion caused "the power" to be transferred into the body of a new powerful being composed of Hedison, Silver and Auric. This new being, seeking revenge, grabbed the whole Chess Set in his hands made of crackling energy with the purpose to kill them. Guardian begged him and convinced him to let them live. The being disappeared in a glow of light and the Chess Set and many of the other criminals were ready for The Vault. Comments: Created by Simon Furman (writer), Craig Brasfield (pencils), Frank Turner (inks). The Chess Set was composed by pieces of different colors: Black (the King and the Tower), Brass (the Bishop), Green (the Knight), White (the Queen, if we consider the hair color, Black if we consider the floating bends around her). Killer Queen was a worshipper of Shiva, like Dansen Macabre, and the bands were an aspect of her powers. or any other character with a similar name. or any other "Dark" character or "Tower" place. Killer Queen, song by the Queen: "...She's a killer Queen -- Gunpowder, gelatine -- Dynamite with a laser beam -- Guaranteed to blow your mind -- Anytime..."
any other "Killer" or "Queen" character. or any other "King" character. Overknight has no known connections to any other "Knight" cheracter. Dark Tower was tall and muscular. He controlled the Darkforce which he could release from his hands. 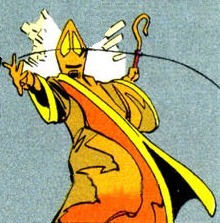 Dark Tower obeyed Brass Bishop's order, like his comrades, not to enter the fight started by Spider-Man and Guardian, but to stay near the device for "the power" transfer. However, they were all surprised by Nemesis' attack. Dark Tower shot his Darkforce, but missed her. Always silent, he was shooting again but he was stopped by Overknight, because Nemesis was too near the Nexus of "the power" transfer device. Nemesis made the device explode and Dark Tower was carried away by the explosion like the others. The entity's (Hedison, Auric & Silver) energy grip was too strong for him. Within it his powers were useless. Killer Queen could use and sow Death Dust. She held the Death Dust in two little pouches bond to her wrists. It is unknown how the Dust affected persons and if it caused Death. To use the Dust against an opponent, she needed proper room to not hit other persons. She seemed always dancing, so she had probably agility and endurance superior to a normal human being. Apparently she also didn't feel cold, or the Death Dust had a warming effect on her body. The Killer Queen danced all the time during the auction. She also continued to dance while fighting Nemesis and was picking up some Dust from a pouch when Nemesis destroyed the Nexus which exploded. King Coal could transform his hands into objects of various forms, such as spikes or blades. He could modify the form almost instantaneously, but if he lost part of his mass it took him an unspecified amount of time to grow it back, depending from the size of the piece he had lost. His strength level was above normal, at least on an athlete's level. King Coal was the first to be taken off guard by Nemesis. His left hand-blade was cut off by Nemesis' all-cutting sword. This would have shocked any other person but King Coal acted promptly and managed to knock down Nemesis with a blow of his right hand. As a result she was launched to smash into the Nexus, the device cocoon prepared for the person who bought "the power". King Coal immediately changed the form of his right hand into a blade, but Nemesis slashed the Nexus with her sword and provoked the explosion of the device. An entity composed of Auric, Silver and Hedison emerged from the explosion and grabbed the Chess Set members. His energy grip was killing all the Chess Set, but Guardian saved them. Overknight was the battlefield leader. He wore a medieval-like complete armor. He wielded a lance which could shot energy beams and a shield for protection. The Chess Set had to protect the "goods" that Brass Bishop wanted to sell, but they were taken off guard by Nemesis. Overknight shot at Nemesis with his lance but his beam was deflected by Nemesis' blade. The explosion of the device destroyed by Nemesis seemingly didn't hurt him, but he was unprotected in the entity's (Auric, Silver & Hedison) energy grip.